If you’ve been experiencing persistent pain in your hands, you may be wondering if arthritis could be to blame. But which type of arthritis in your hands might be the issue? The answer isn’t always obvious. The two most common forms of arthritis — osteoarthritis (OA, or degenerative arthritis caused by wear and tear on the joints) and rheumatoid arthritis (RA, an inflammatory type of arthritis caused by inflammation in the joint) — share many symptoms in common. Plus, there are other, less common forms of inflammatory arthritis that affect the hands that your doctor will need to consider as well. Both osteoarthritis and inflammatory arthritis can cause pain, stiffness (particularly in the morning), swelling, and tenderness of the joints in the hands. But people with inflammatory forms of arthritis like rheumatoid arthritis may display additional symptoms that aren’t seen in those with OA. How long morning stiffness lasts can be revealing in determining which kind of hand arthritis you may have, he adds. People with inflammatory arthritis usually experience prolonged stiffness that lasts an hour or longer, while stiffness often eases in just five to 15 minutes in those with OA. If your hand arthritis symptoms suggest inflammatory arthritis, Dr. Byram says the most likely culprit is rheumatoid arthritis (which often begins in the hands) but it could also be psoriatic arthritis (PsA), which commonly affects the hands too. Other symptoms of PsA include having puffy fingers and toes that resemble sausages (a condition called dactylitis), skin plaques, and pitted nails. Your doctor will also need to consider whether your symptoms are due to palindromic rheumatism (PR), an episodic form of inflammatory arthritis (though palindromic rheumatism is rare). PR can attack any joint, but most commonly affects the hands. Gout, a type of arthritis caused by high levels of uric acid in the body, could also be the culprit. However, while gout can affect the wrist and fingers, it is most likely to attack your big toe. 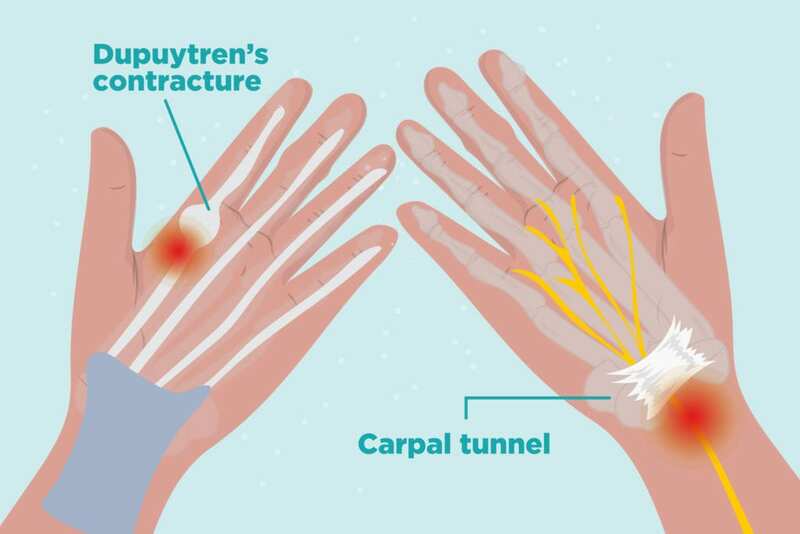 Hand pain is also a sign of Dupuytren’s contracture, a condition in which the tissue of the palm and fingers becomes thickened and tight, causing the fingers to curl inward. It’s not clear why Dupuytren’s contracture develops, though those who smoke, drink a lot of alcohol, and have seizures or diabetes are more vulnerable to developing it. Your doctor will also consider whether your hand pain could be due to carpal tunnel syndrome, says Dr. Byram. “RA can be a cause of carpal tunnel syndrome, so if we see someone who has carpal tunnel, we’ll want to make sure they don’t have RA.” Carpal tunnel is a condition that occurs when one of the major nerves to the hand — the median nerve — is squeezed or compressed as it travels through the wrist, according to the American Academy of Orthopaedic Surgeons. To determine what’s behind your hand pain, your doctor will rely on your medical history, a physical exam, and imaging and blood tests to make a diagnosis and determine what kind of arthritis hand pain (if any) you have. Imaging tests, such as X-rays or an MRI, can reveal joint erosion (seen in patients with inflammatory arthritis) and osteophytes and loss of cartilage (characteristic of OA). If your doctor suspects inflammatory arthritis, they will also order blood tests to detect the presence of certain antibodies, such as rheumatoid factor or anti-CCP, that help identify RA and other types of inflammatory arthritis. If you’re diagnosed with an inflammatory form of arthritis, you have more treatment options than someone with OA. While nonsteroidal anti-inflammatory drugs (NSAIDs) can help manage the pain of both types of arthritis, the development of disease-modifying antirheumatic drugs (DMARDs) and biologics has vastly improved the prognosis of those with inflammatory forms of arthritis by reducing inflammation and preventing further joint damage. Cortisone injections can be useful for those with OA and conditions such as RA, though they’re usually used in patients whose inflammatory arthritis is limited to just one or two joints, Dr. Byram says. Injections of hyaluronic acid can be helpful for those with OA (the substance helps lubricate the joints), but these are better for managing pain in larger joints like the knees rather than the hands. 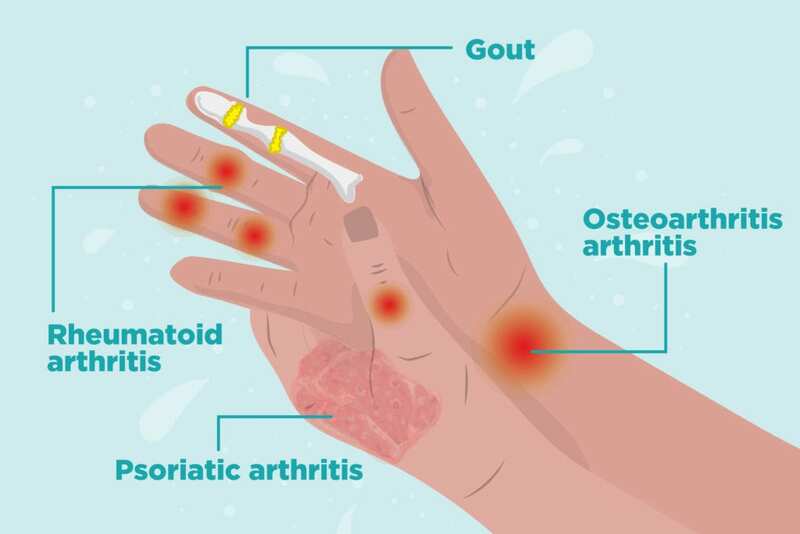 Fortunately, there are several at-home therapies that can help ease symptoms of both osteoarthritis and RA and other kinds of inflammatory arthritis in the hands. He also recommends that patients with arthritis of the hands work with hand therapists. These medical professionals can show you how to make everyday activities easier and help you avoid stressing your painful joints by using assistive devices. Hand therapists can also provide you with simple exercises to maintain range of motion in your fingers, and may also recommend using splints to ease stress on your joints. Wait: Is the Ketogenic Diet Good for Gout?